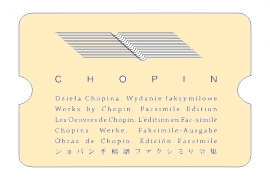 On October 17, 2005 the launch of a new series—Works by Chopin.Facsimile Edition took place. This international academic publishing project, undertaken by The Fryderyk Chopin Institute and the Publishing House "Bernardinum", aims to publish all the available manuscripts of works by Fryderyk Chopin in facsimile form, with commentaries by leading Chopin scholars. Works by Chopin. Facsimile Edition is the first of its kind on such a grand scale. Participating in this venture are representatives from Poland, France, the UK, Switzerland, Germany, Spain, USA and Japan in addition to libraries and universities where Chopin manuscripts are held, music publishers and Chopin societies. The purpose of this edition is to preserve and disseminate the Fryderyk Chopin legacy in Poland and across the world by reproducing and safeguarding the contents of his manuscripts scattered around the world, make the original Chopin texts accessible for research purposes, enable performance practice to approach as near as possible the composer’s intentions, verify knowledge regarding sources, and to disseminate this knowledge via up-to-date commentaries furnished in six languages: Polish, English, French, German, Spanish and Japanese. "Chopin provided his publishers with various types of Stichvorlage, including autographs, annotated proofsheets, and scribal copies. In each case, the music continually evolved as autograph or scribal copies were prepared or proofsheets corrected, resulting in significant differences between the multiple first editions. Further differences arose from the interventions of house editors and proof-readers in successive impressions which until recently have simply been regarded as "first editions"—an error of judgment that has undermined much Chopin scholarship. Only now is the importance of these differences fully realized— likewise that of the first editions as a whole, which constitute one of the principal sources of knowledge of Chopin’s music." 30. Lento con gran espressione in C♯ minor, op. posth. Sand” Collection in Valldemossa. (2017), 2 + 45 pp. OMI would be pleased to serve as your subscription agent for this important publication.